Hand crafted, made with tru-moccasin full-flex construction. 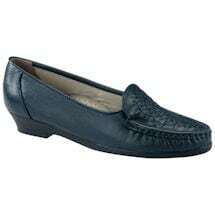 Soft and breathable, full grain leather uppers, "cradle" your feet. Feels like slipping your hand into a glove. Fully cushioned and lined, they give you plenty of toe room. Flexible outsoles for walking comfort. Try a pair…and discover the ultimate in foot freedom! 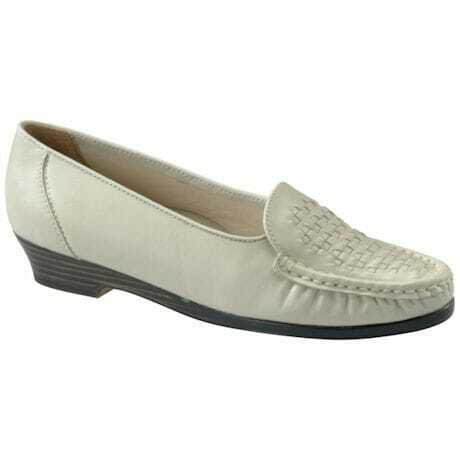 Soft leather upper is hand sewn with tru-moc construction for excellent flexibility. Elastic gore, hidden under the vamp, stretches to fit your foot while holding the loafer securely as you walk. The insole has a soft tricot foam lining and long wearing polyurethane outer sole. 1" heel height. Imported. 5082 Last. Handcrafted, Soft Spots® are made with True Moccasin construction that "cradles" your foot by wrapping it completely in soft, breathable leather. Like slipping your hand into a glove. 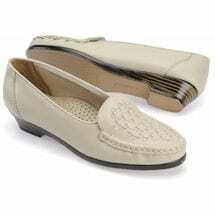 Fully cushioned and lined, they give you plenty of toe room and flexible, walking comfort. Try a pair…and discover the ultimate in foot freedom! Item can only be shipped within the Continental US.